Since the quality of yarn primarily depends on the quality of cotton, immense efforts are taken to ensure that only cotton of the highest quality is chosen for production. This is achieved by conducting stringent tests at our laboratories in addition to maintaining a good rapport with our cotton suppliers. Quality in each mill is taken care of by the quality assurance department manned by well trained technicians, equipped with advanced testing equipment and also by adopting various control measures based on a well researched and drafted quality plan right from raw material arrival to goods dispatch. 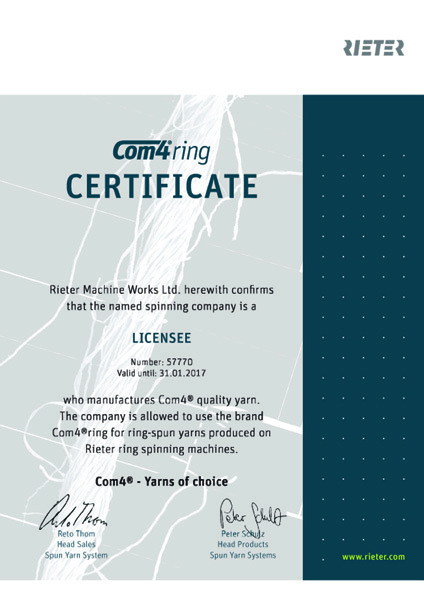 Machines fuelled by the latest in technology are equipped with online monitoring systems like auto levelers and yarn clearers to achieve 100% inspection and rectification. Good work practice followed by our dedicated work force also adds to the quality. The instruments available includes Uster Tester-5,Uster Tester-4, Uster HVI Spectrum, Uster AFIS Pro 2,UsterTensojet 4, Uster Quantum Classimat Tester, Mesdan Splice Tester 3 among a plethora of others. To ensure quality at every stage and to achieve fine quality production. To be customer oriented and supply products that satisfies the customers. To take continuous efforts to improve the quality and productivity through technology up-gradation. To maintain market leadership and to meet customer requirements. To promote quality awareness through continuous training and refresher programmes. To achieve, maintain and improve international quality levels in products through personal involvement, teamwork and by providing a better environment. The group received ISO 9001:2008 certification from UKAS Quality Management system for the first time in 2003 and continues maintain it. 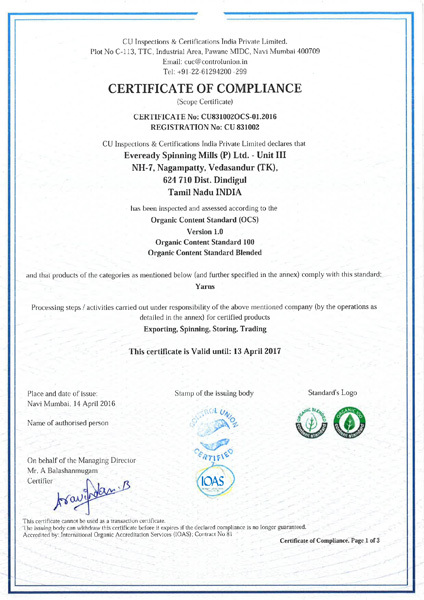 Eveready Spinning Mills Unit3 received control union certification for Organic Yarn manufacturing in 2010 and continues to maintain it by renewing it every year. About 80% of the total spindleage was converted to compact spinning system in 2010. ERP was introduced in 2007 in production, materials management, sales, finance, costing, quality and maintenance. 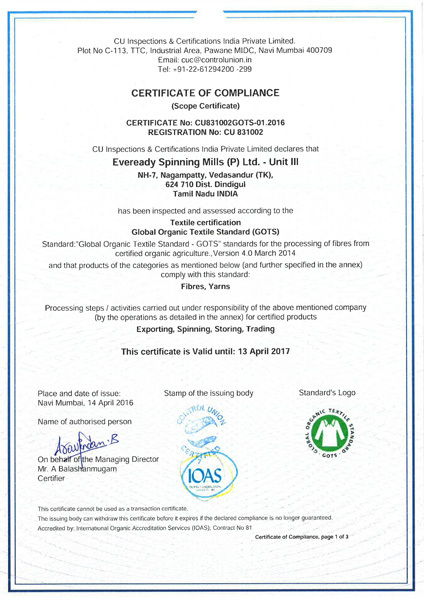 Eveready Spinning Mills unit 3 BCI (Better cotton Initiative) member Feb 2014. 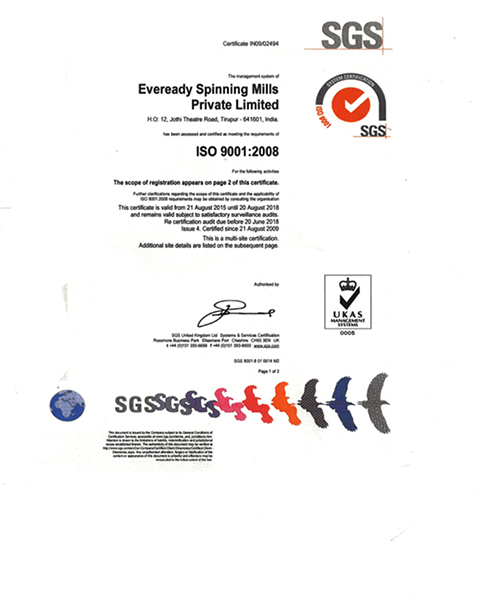 Eveready Spinning mills unit 3 is Oeko-Tex standard 100 product class I certificate holder.